The Caja Badajoz is an important savings bank in the southern Estremadura region of Spain. Drawing inspiration from the surrounding landscape, Estudio Lamela designed the office building to have a gently sloping green-roofed plinth from which emerged a striking tower. Large louvers on both volumes help mitigate the sun's impact on the interior, keeping the offices airy and light. 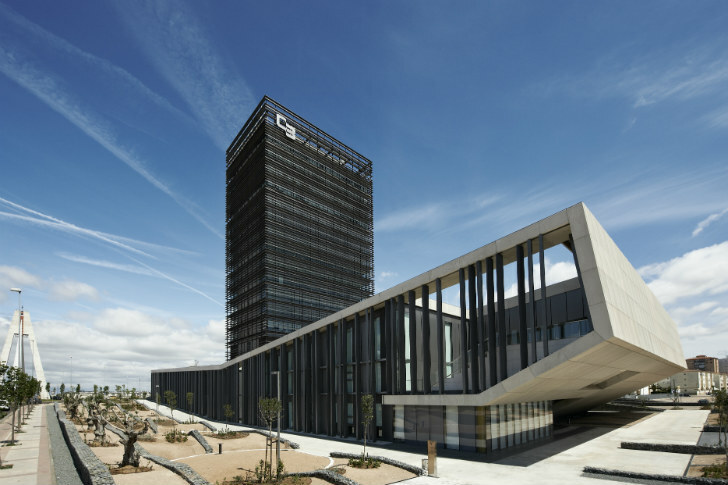 Caja Badajoz is a new bank headquarters for the Estremadura region and serves as a powerful representation of the community’s economics. Located in Badajoz, the bank sits proudly on a plot located on the banks of the Gévora River next to the Puente Real Bridge. Estudio Lamela won the award to design the project, which began in 2007 and was completed in 2010. The building is composed of a large wedge-like plinth in a park setting that is topped off with a green roof. A large tower rises from the center to match the architecture of the nearby prominent bridge. The lower volume provides space for a restaurant, auditorium and exhibition hall, while the 16-floor tower serves as office space for the Caja. The sun is quite powerful in this region and to minimize its impact and reduce heat gain, the exterior features a series of louvers. Vertical metal strips protect the lower volume while horizontal strips protect the tower. The louvers work in combination with the glass facade to create a double skin to allows daylighting to pass through and helps keeps things cool. Inside, the goal was to create light and airy open spaces with views that open up towards the landscape. 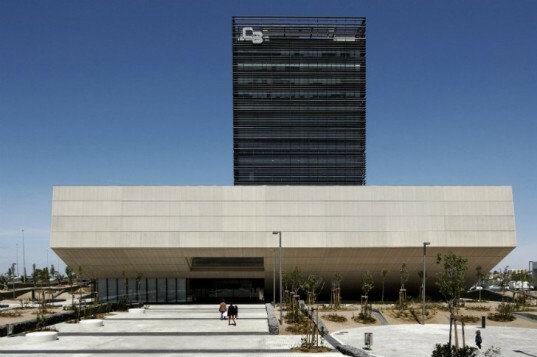 Caja Badajoz is a new bank headquarters for the Estremadura region and serves as a powerful representation of the community's economics. Located in Badajoz, the bank sits proudly on a plot located on the banks of the Gévora River next to the Puente Real Bridge. Estudio Lamela won the award to design the project, which began in 2007 and was completed in 2010. The building is composed of a large wedge-like plinth in a park setting that is topped off with a green roof. A large tower rises from the center to match the architecture of the nearby prominent bridge. The lower volume provides space for a restaurant, auditorium, exhibition hall, while the 16-floor tower serves as office space for the Caja. The sun is quite powerful in this region and to minimize its impact and reduce heat gain, the exterior features a series of louvers. Vertical metal strips protect the lower volume while horizontal strips protect the tower. The louvers work in combination with the glass facade to create a double skin to allows daylighting to pass through and helps keeps things cool. Inside, the goal was to create light and airy open spaces with views that open up towards the landscape.